Lukacs wears her gold medal jacket proudly. 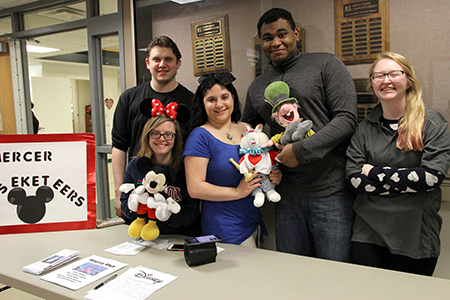 Meaghan (in blue), a founding member of the Mercer Mouseketeers, with some of her MCCC friends. 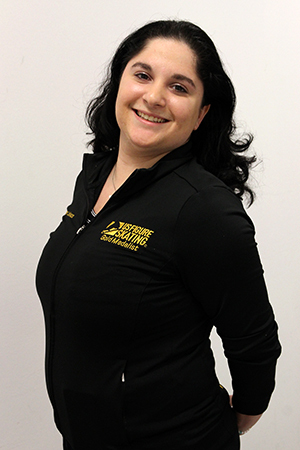 West Windsor, N.J. – Mercer County Community College (MCCC) student Meaghan Lukacs, of Hamilton, has been tested many times in her young life. A competitive figure skater since the age of eight, she reached the top level of her sport this past November by advancing through eight levels of free style competition to become a U.S. Figure Skating Gold Medalist in Colorado Springs, Colo.
She wears her U.S. Figure Skating Association gold medal jacket proudly. “A lot of blood, sweat and tears went into getting it,” she said, adding that as she watched Olympic skaters perform amazing feats in Peoyong Cheng, South Korea, in February, she was keenly aware that beyond their magical jumps, spins and glides were countless hours of hard work and sacrifice, good days on the ice, and bad. Her own journey to gold began when her mom first put her on the ice at the age of three, just for fun. “But I never fell, not once. I seemed to have the coordination and balance for the sport,” the 22-year-old recalls. Lukacs began to pursue ice skating with zeal and, 19 years later, she is still at it. Throughout middle school and high school, she practiced at the Princeton Skating Club, eventually becoming an assistant coach. By the time she was in high school at Notre Dame, she was certified as a basic skills instructor, working with children between the ages of three and nine. While never in training for the Olympics, Lukacs has, nonetheless, participated in competition at the highest levels. “There are numerous competitions around the state of New Jersey. I did two per year from the ages of 8 to 13,” she said. Lukacs explains that skaters compete in groups in their home state and then the top skaters travel to Colorado Springs, where medals are on the line. “U.S. Figure Skating requires eight levels of advancement from preliminary to gold. The requirements get more challenging with each level – the steps, the timing, the precision. And the judges don’t let anything go,” she notes. In her teen years, she focused on U.S. Solo Ice Dancing, which she describes as ballroom dancing on ice. She had an undefeated streak in East Coast competitions. In 2011, she traveled to Colorado to compete in ice dancing. “I lost the gold by a hair, but was still proud to stand on the podium with my silver medal,” she said. These days, Lukacs logs in her practice hours at Iceland in Hamilton. “My friends from Mercer have come to see me skate,” she says with satisfaction. Indeed, the supportive community she has found at MCCC has made her college experience a pleasure. With a mild form of dyslexia that challenges her to “learn differently,” she notes that the smaller class sizes and caring faculty to be a great fit. “Professors go out of their way to challenge you and help you succeed,” she said. Lukacs' performances are not just confined to the ice. She has been singing her whole life, performing in church choirs, school shows, and foreign language operas. When she enrolled at Mercer in 2016, she was originally a Theatre major and was featured in two Theatre Program productions. This year, Lukacs switched her major to the more practical arena of event planning and will earn her associate degree in Hotel, Restaurant, and Institution Management. She then plans to transfer to Fairleigh Dickinson University, which offers bachelor’s and master's degree programs in Hospitality Management as part of The University Center at Mercer. She is also a founding member of the Mercer Mouseketeers, currently serving as the club’s vice president. She says the group’s goal is to spread the love by focusing on the positivity and artistry of the Walt Disney Company. Lukacs reflects that her training as a skater has prepared her for many of life’s challenges. “Ice skating has forced the two sides of my brain to work together and it has helped me developed inner strength,” she said. And through skating, Lukacs has come to understand the importance of community – from her supportive parents, to skating coaches like Charles Fetter, who passed away in 2014 and guided her skating until the end of his life, to her great group of friends at Mercer, who have become like yet another family.